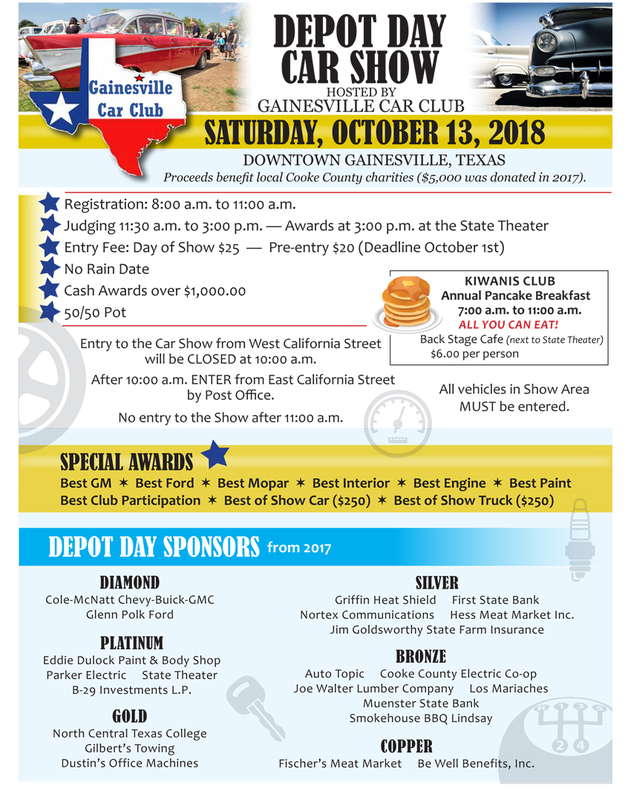 This is the Gainesville Car Club’s annual show in conjunction with the Depot Day festival. The show is downtown Gainesville, TX and is headquartered at the State Theater on California Street. There are 9 special awards, $1000.00 in cash awards, 35 classes. Pre-entry is $20.00 and must be postmarked by October 1st. Day of show entry is $25.00. All proceeds go to local Gainesville charities. Registration is from 8-11 and judging begins at 11:15. Awards at 3 p.m. Registration forms can be seen and downloaded from the Gainesville Car Cub Facebook page or gainesvillecofc.com/chamberevents.